Pooja Kumari from Chandigarh, B.Sc Graduate. Pooja Kumari is MBA HR FRESHER and currently have no work experience. RECRUIMENT TRAINIGN & DEVELOPME.. EMPLOYEE ENAGAMENT INDUCTION & JOINING .. EMPLOYEE DATA MANAGE..
are one of expert skill area's of Pooja Kumari . 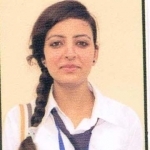 Pooja Kumari is working in Human Resources industry.